I know at least some of you are familiar with this monthly meme, started by my dear friend Kristen, and now picked up again by my OTHER dear friend Christy. :) I love how introspective it makes me. All you have to do is post what you've been doing/thinking/? 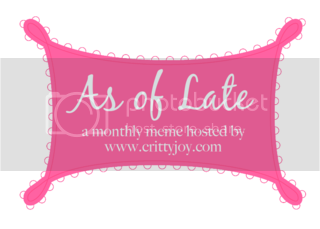 ?ing lately, then link up at Christy/Critty Joy's blog - and read other folks' thoughts as well. The linkup is on the third Thursday of the month, but Christy said she'll keep it open for a week - so don't feel like you need to do it RIGHT NOW. You're always welcome. Lately, I've been reading (rather than writing) my WIP - and getting all kinds of ideas on how to improve it! And so I have been wondering: what has been going on with you as of late? And don't forget to check out Christy's blog, and link up there with your own list! So good to hear the questions of your heart. Love you, dear Jo, and praying for you always. I've been learning how much I need my friends lately too! It's a much needed lesson because I try to be far too self sufficient and it's good to learn that I need others. This is a wonderful list... praying for big things! Lately life has been a mixture of blessings - wonderful fellowship at small group weekly, wonderful messages at church, good friends who call to say, "How you doin? ", blessed by my adult children and my grandchildren - the list goes on! But also life has been tough - mom in a nursing home, passing away of father, illness that lasted a month, car problems - that list goes on as well. And when God asks me if I am happy, in a sense I can always answer "Yes" because He is always with me, and I am learning to trust Him more fully. One thing to add to list of blessings - bloggy friends like you who share the things God puts on their hearts. I sometimes forget about the waiting for "big news" but I'm always relieved that I can -- would hate for that waiting to completely consume me! Forgetting you are waiting can be a good thing in my opinion...this is coming from an overthinker. I am learning to depend on friends more...they are such a beautiful gift from God. So glad you joined us sweet Joanne! I love this meme, it helps me put things in perspective too. When I read other blogs, it also gives me things to pray for. You are such an encourager it's a pleasure to pray for you.